Even after being relegated to a desk job, Mr. Incredible continues to battle evil in his spare time. 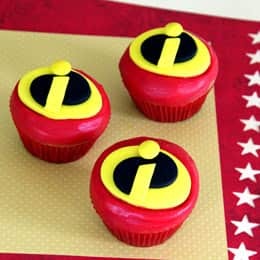 This treat, inspired by the logo on the popular Super's crime-fighting suit, makes a fitting tribute to an equally deserving hero on Father's Day. Tip: If the cupcake tops are overly rounded, use a kitchen knife to level them first. This will allow the Mr. Incredible emblem to set flatter in the frosting. 2. Roll out the two fondant colors separately between sheets of wax paper. 3. For each cupcake, use the larger fondant cutter to cut out a yellow oval and the smaller cutter to cut out a black oval. 4. Slice each of the black ovals into two pieces so that the left piece is about half the width of the right piece. 5. Place the two black pieces atop a yellow oval, off-setting them slightly, as shown. 6. Gently press an M&M's candy into the fondant at the top of the oval, as shown, just until it sticks in place. 7. Add a thin strip of yellow fondant (angled at the top to resemble the letter i), positioning it below the M&M candy, as shown. 8.Place a completed fondant emblem atop each cupcake, gently and evenly pressing it partway into the frosting.